The year 1994 marked the 100th anniversary of the birth of one of America's most famous artists, who considered himself an illustrator. 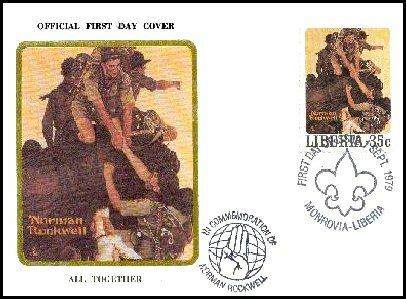 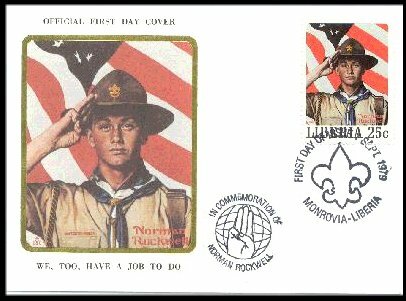 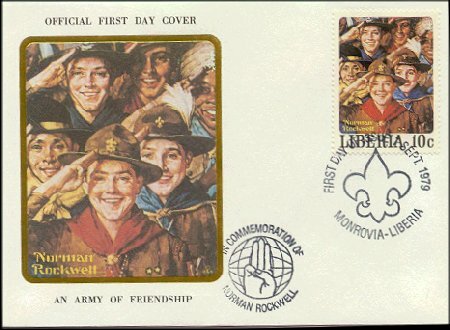 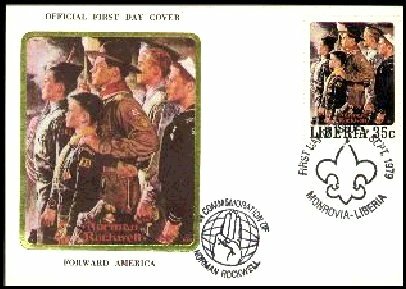 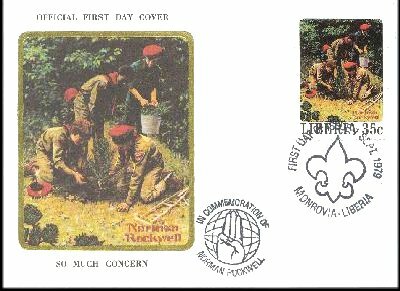 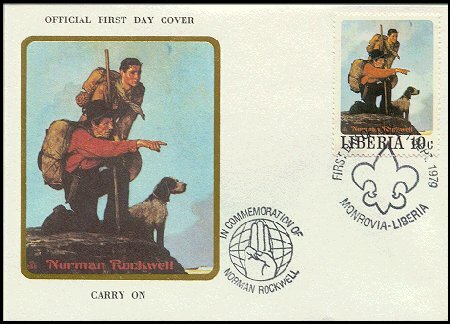 In addition, Norman Rockwell's artwork appeared on United States postage stamps, including Boy Scouts of America (1960), City Mail Delivery (1963), Tom Sawyer (1972), and a stamp honoring the Peace Corps, which was issued as part of the 1960s Celebrate The Century pane in 1999. 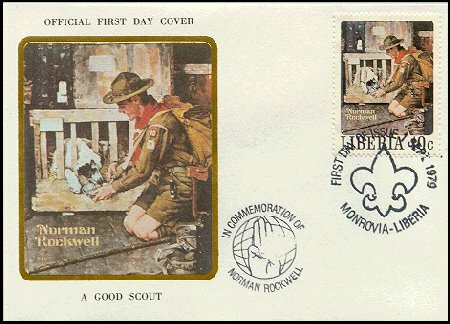 Norman Rockwell began his career with the Boy Scouts of America in 1912 as an illustrator for Boy's Life. 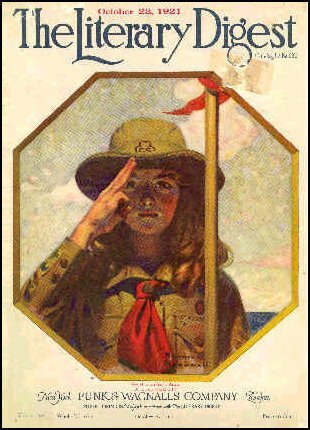 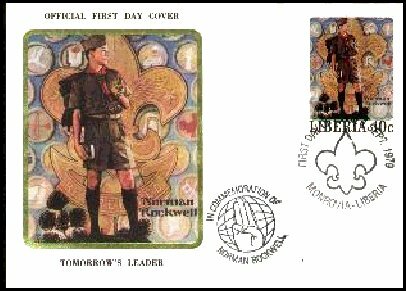 Brown & Bigelow introduced his first Scout calendar in 1925. 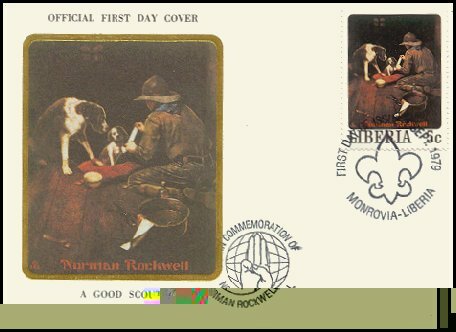 This was the first of fifty Rockwell calendars issued through 1976. 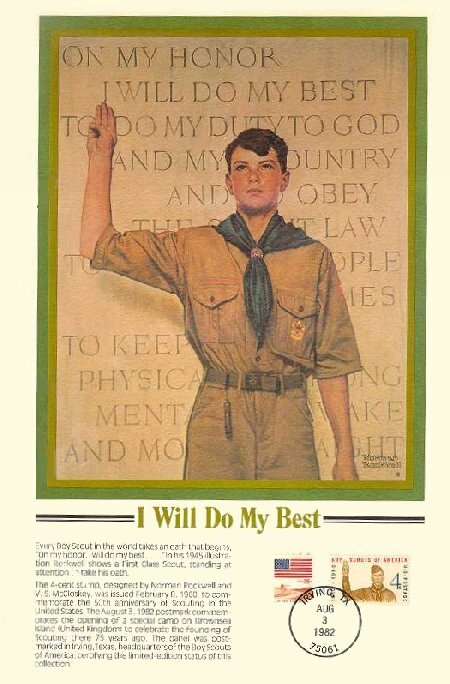 His work provided covers for the Saturday Evening Post, Boys Life magazine, and Boy Scout handbooks. 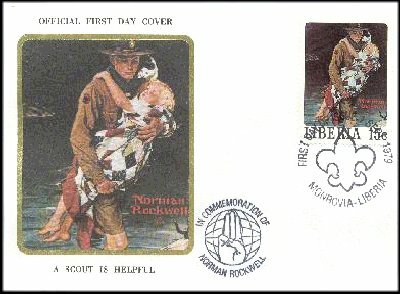 Norman also painted several illustrations of Girl Scouts that appeared on the cover of national magazines. The U.S. 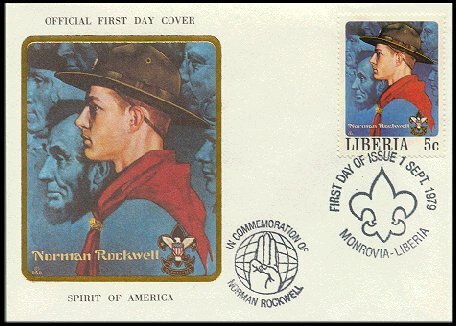 Postal Service made him a stamp designer, commissioning him to design three different stamps. 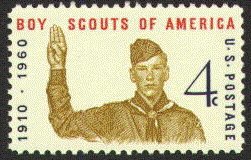 The first one was the 1960 four cent Boy Scout stamp. 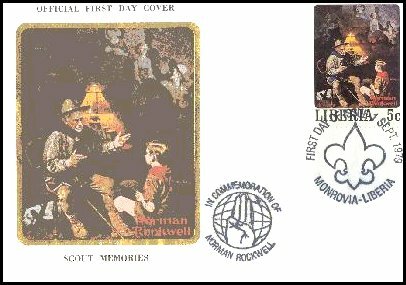 The second one was the 1960 five cent City Mail stamp, and the third was the Tom Sawyer eight cent stamp of 1972. 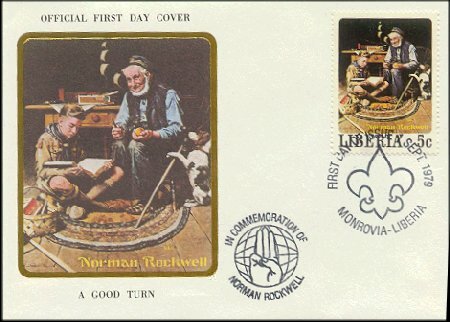 In addition to the Rockwell paintings being used on stamps, they have been reproduced on Christmas seals. 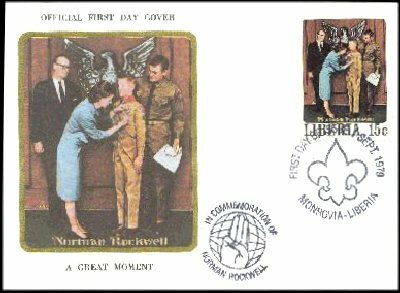 For the Boy Scout stamp, Mr. Rockwell brought 14-year old Thorton Percival of Stockbridge, Massachusetts into his studio in Scout uniform to be his model. 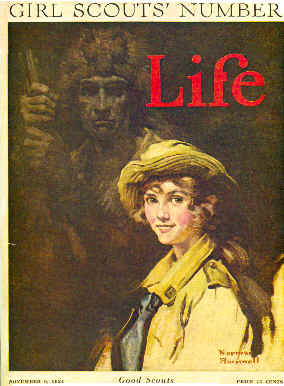 Thorton was 14 years old at the time. 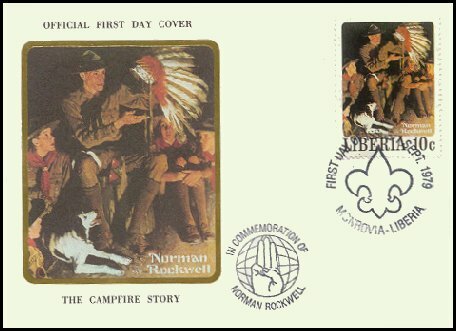 This stamp became one of the most popular U.S. stamps with a printing of over 139 million. 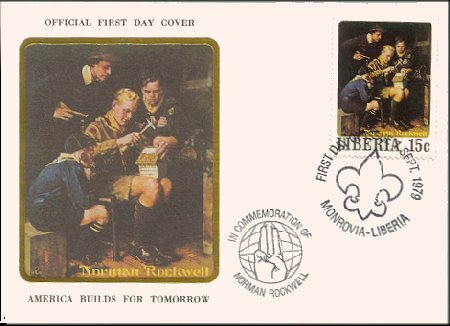 A truly rare, possibly unique cover, this cover is autographed by both Norman Rockwell and Thorton Percival and addressed to Catherine E. Kendall. 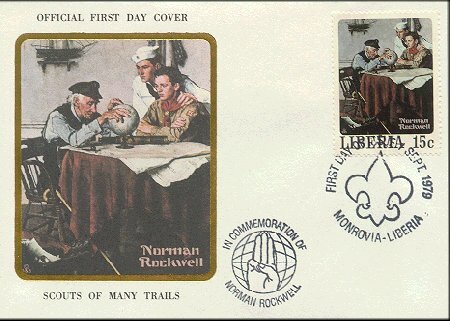 Norman Rockwell's autograph is highly coveted, being quite scarce. 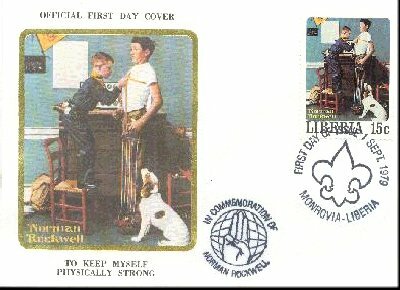 Percival's autograph is an unknown entity, together they make a truly unique item. 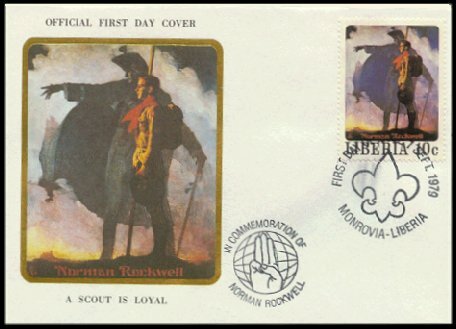 Letter by Thorton Percival to Catherine E. Kendall. 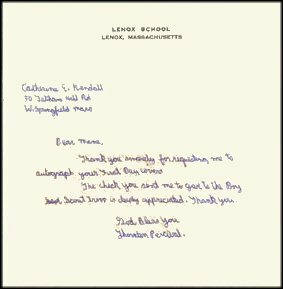 This is a hand-written letter by Thorton Percival thanking a Catherine E. Kendall who requested that Thorton sign the cover. 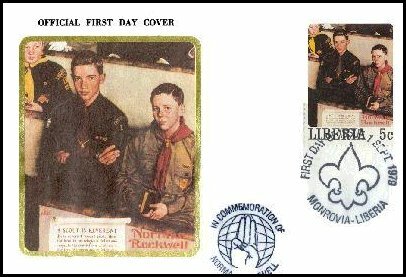 It is addressed on Lenox School stationary, the school Thorton attended at the time. 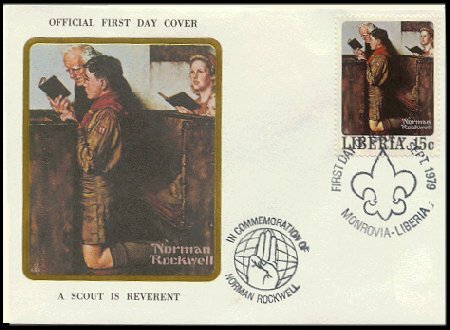 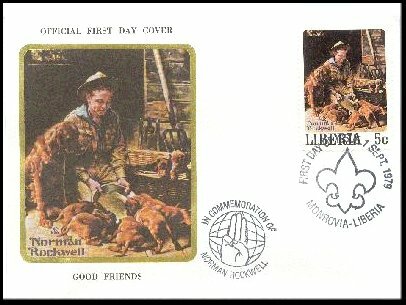 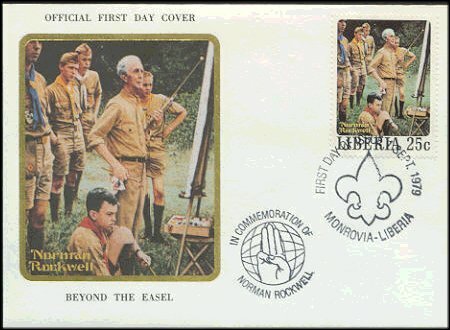 Liberia in 1979 issued a set of 50 of the famous annual Boy Scout calendar paintings of Norman Rockwell. 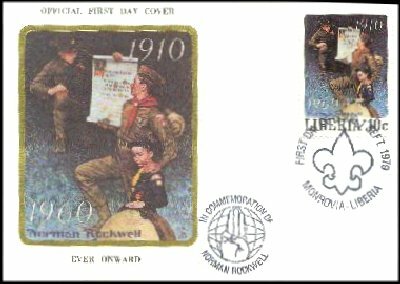 Each stamp was affixed to a special official government First Day Cover in a limited set of 20,000. 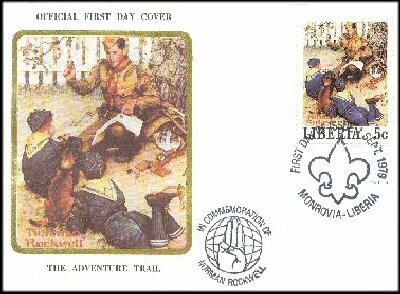 Here is a selection of these cachets and stamps. 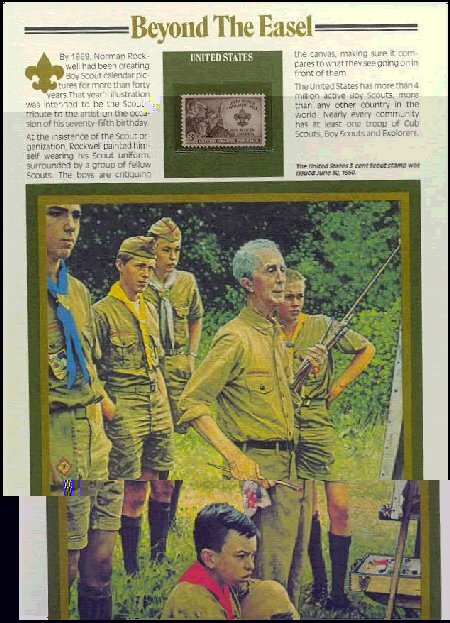 "A Good Sign All Over the World"
"We Too Have A Job to Do"
"I Will Do My Best"
"We Thank Thee, Oh Lord"
Zaire issued a "Salute to the artist, Norman Rockwell" featuring covers from the Saturday Evening Post in 1981. 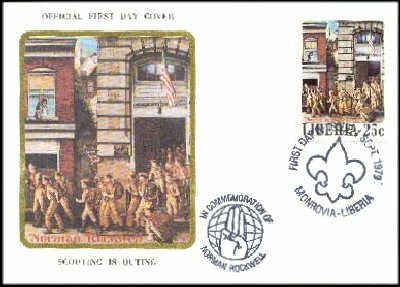 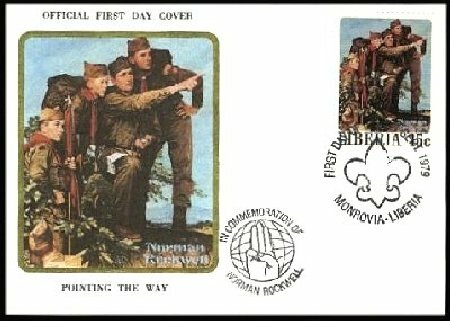 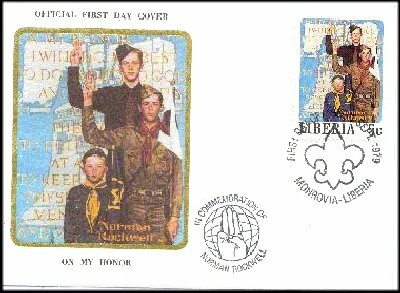 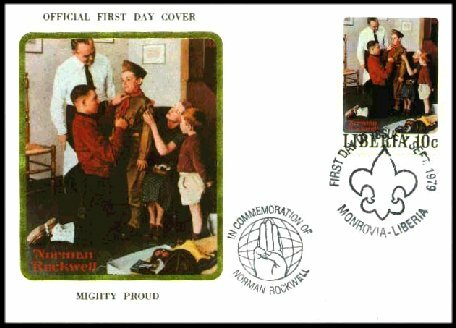 One stamp, #1006, included an illustration of a Boy Scout. 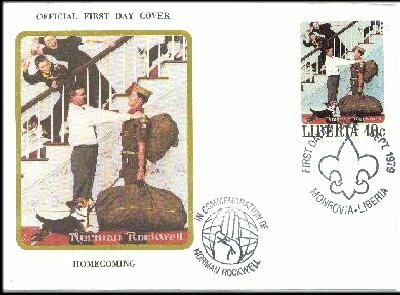 A provisional surcharge issue overprinted the #1006 stamp in 1994. 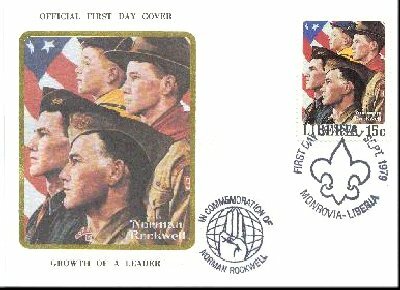 A Good Turn", "Good Friends", "An Army of Friendship", "The Campfire Story", "Scouts of Many Trails", "A Scout is Reverent", "We, Too, Have a Job to Do", "I Will Do My Best", "Mighty Proud", "A Good Sign All Over The World", "Breakthrough For Freedom", "Beyond The Easel", "Can't Wait". 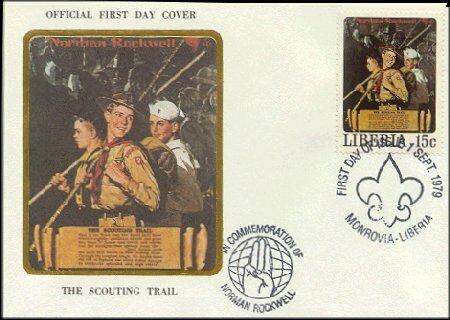 This particular panel from the Postal Commemorative Society Folio features the 1945 Rockwell painting "On My Honor." 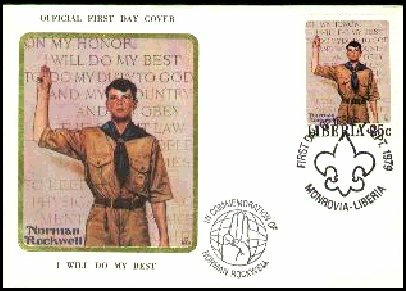 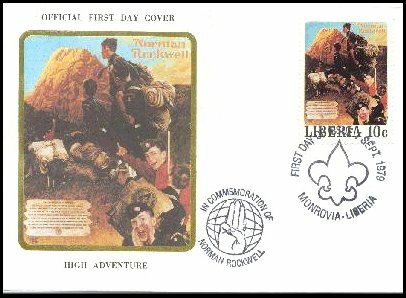 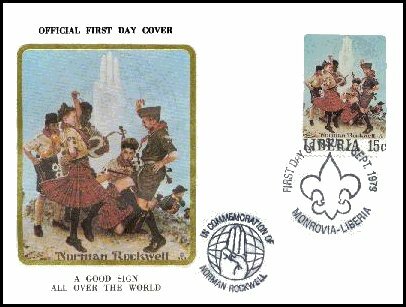 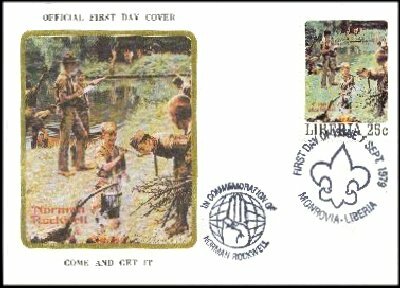 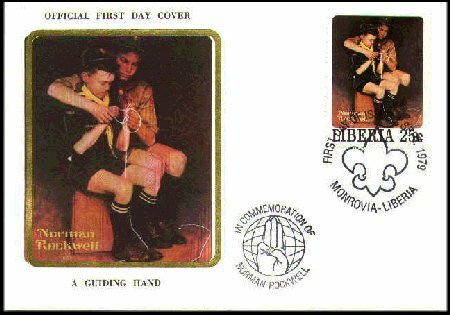 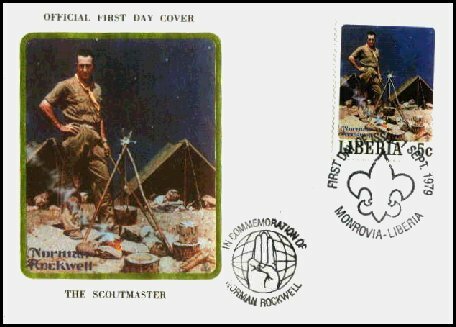 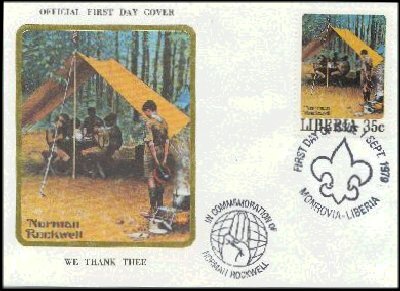 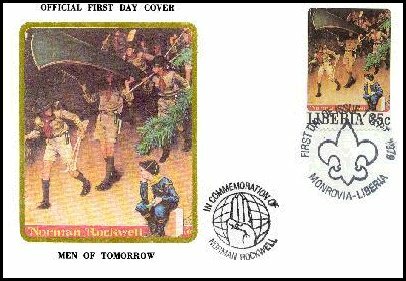 The August 3, 1982 postmark commemorates the 75th Anniversary of Brownsea Island, the first Scout camp. 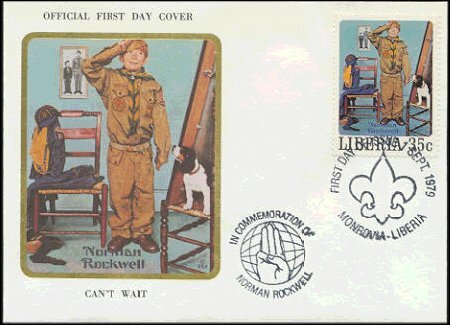 Anyone interested in viewing Mr. Rockwell's Scout paintings can see the majority of them today at the National Scouting Museum adjacent to the B.S.A. 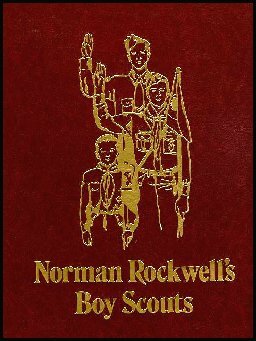 Headquarters in Dallas, Texas.